Thanks in part to a growing interest in global cuisine, fresh mangos are available year-round in most supermarkets. Juicy and delicious, the mango is an orange-fleshed fruit with a peachy-pineapple flavor. Any time of year is the perfect time to add a sunny splash of tropical mango to fruit salads, salsas, drinks and desserts. Keep mangos on hand to brighten up smoothies and shakes or blend into decadent cream pies, but don’t limit this versatile fruit to desserts! Need a fresh side to serve with spicy dishes? Chopped mango adds sweet flavor to tacos and other Mexican recipes. (It’s delicious with BBQ or pork chops, too!) Mix mango with cream cheese for an easy appetizer spread, or scatter chopped mango on salad entrées for a colorful, flavorful topping. The possibilities are endless. Select mangos that are firm, but not hard, and give slightly when gently squeezed. Avoid any with soft spots. 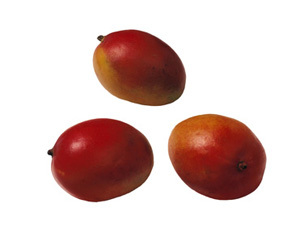 Ripe mangos have a sweet, fruity aroma around the stem end and smooth, yellow- to red-blushed skin. Store unripe mangos in a paper bag at room temperature until ripened. Refrigerate ripe mangos for up to 4 days. Wash mangos before cutting. A long, flat seed runs down the center of each mango. Use a sharp knife to carefully cut around the seed and remove it before cutting up the fruit. Cubing a mango: Hold the mango stem-end up on a cutting board. Carefully slice through the flesh slightly to the right of the stem and seed. Repeat 2-3 times or until the flesh is removed from the seed. Score the flesh in a crisscross pattern, cutting up to, but not through, the skin. Holding one mango section in both hands, use your thumbs to press against the skin, popping the mango cubes up. Cut across the bottom of the cubes to separate them from the skin. Substitute chopped mango for other fruit add-ins in quick bread or muffin batter. Whip mango cubes into your favorite blender drinks or milk shakes. Garnish desserts, such as your favorite PHILADELPHIA cheesecake, with mango slices.